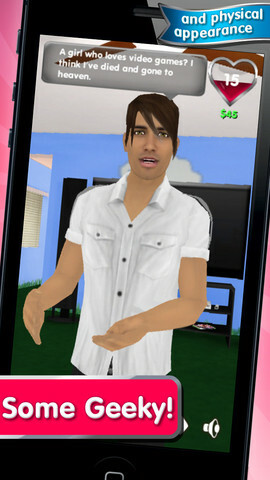 My Virtual Boyfriend is an iPhone app developed by WET Productions Inc. 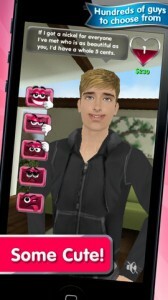 If you’ve ever wanted to date hundreds of unique guys, this fun app is the leading boyfriend simulator in the App Store. By far, the greatest aspect of this app is the photo face mapping feature. That means you can make your virtual boyfriend look like anyone you want, as long as you have a picture of him looking straight ahead. 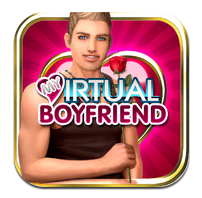 Whether you want to date your favorite pop star or a handsome classmate, My Virtual Boyfriend can create the illusion of your ideal man. Be forewarned that you might need to try a couple of different pictures in order to get the face to blend seamlessly with the rest of the head. At start-up, you’ll provide some details about yourself and about what you’re looking for in a boyfriend. You’ll rate things for yourself and your ideal match on a 1-5 scale, such as Smart, Funny, Wealthy, etc. After you customize your boyfriend’s body, clothes, hair, and eye color, you can take him on virtual dates. Each boyfriend has a particular set of likes and dislikes, which you must navigate by purchasing him gifts in order to make him fall in love with you. You’ll interact with him by suggesting activities and responding to his questions by tapping on emoticons. If you’ve played around with this app in the past and been frustrated by performance issues, there’s good news. The most recent version of the app, Version 2.0, features stability and bug fixes to make your playing experience all the more enjoyable. There are also “zombie boyfriends,” which might appeal to some segments of the user base. With over 25 levels of progressive game play, funny dialogue, and zero ads, My Virtual Boyfriend is a silly (but fun) time waster. 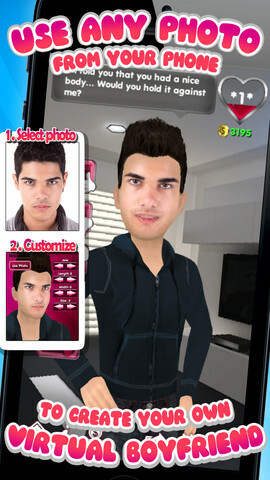 For any young girl who wants a boyfriend all her own, this innocent little app is quite the find. My Virtual Boyfriendis compatible with iPhone 3GS, iPhone 4, iPhone 4S, iPhone 5, iPod touch (3rd generation), iPod touch (4th generation), iPod touch (5th generation) and iPad. Requires iOS 4.3 or later. This app is optimized for iPhone 5.